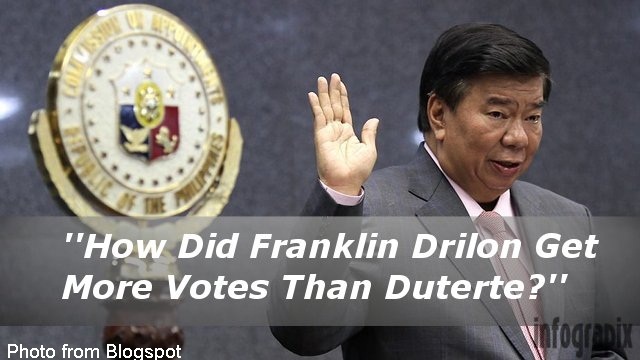 Home / News / Politics / The mysterious 18 Million votes of Franklin Drilon: How did it happen? You must read this! The mysterious 18 Million votes of Franklin Drilon: How did it happen? You must read this! “Is it possible for a voter not to shade a vote for the President field but voted for Franklin Drilon in the ballot?” a blogger asked. 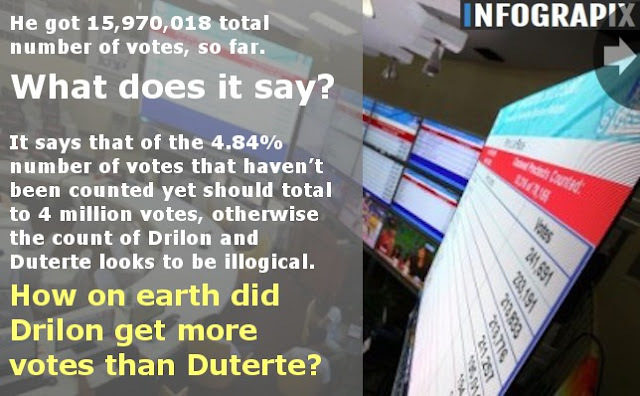 According to Erom Reven, as the author wrote in a blog, a very inquisitive question is taking rounds on netizens for these past few days on how on earth did Franklin Drilon get more votes than Duterte? The author said the netizens doubted how did Drilon got those votes. The author refered to the official tally of votes. 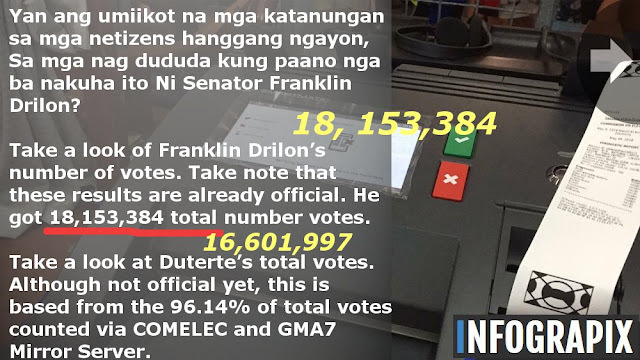 it is remarkable that Franklin Drilon’s votes reached up to 18,153,384 total number votes. On the other hand, PDU30 got only a total number of votes of 15,970,018. The total number of votes has a completion rate of 96. 14%. The author believed that the total count was based on COMELEC thru GMA7 Mirror Server. The author It says that there around 4% unaccounted votes in equivalent to 4 million votes which makes the count of Drilon and PDU30 to be ‘illogical’. The author wondered on why should a voter left a blank for the president field in the ballot, that those who voted for Drilon didn’t vote for Duterte? “How come those who voted for Drilon didn’t even vote for Mar Roxas, when both are in the same party? Roxas only got 9 Million+ votes so far. Half of Drilon’s 18 Million. How come half of Drilon’s votes didn’t vote for Roxas, or at least Duterte”, another mind boggling question that the author posted. The same situation happened to Villanueva, the author pointed out. Another interesting fact the author has laid is that on 2010 Presidential elections, PNOY only got 12,789,741 numbers of votes based on official results and for the number one Senator Bong Revilla, the senator garnered a total number of 16,548,779 votes.